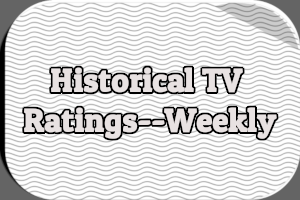 Retro Review examines episodes of short-lived, forgotten, or obscure television shows. Each column includes both a summary and a review. NOTE: My copy of “Mabel’s Voice” is missing the closing credits, so I don’t know who wrote or directed the episode. 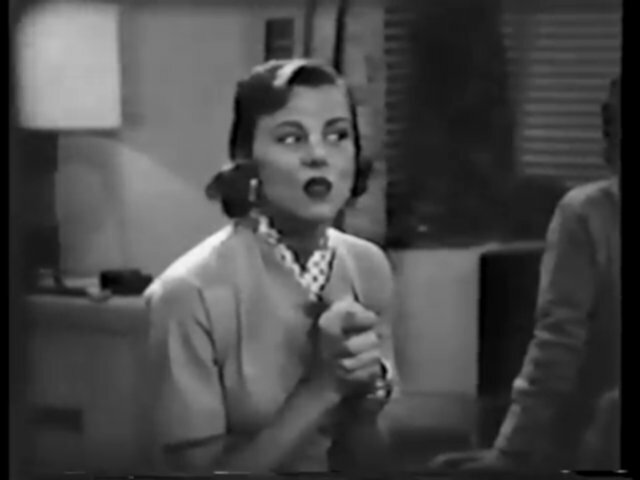 Based on a 1941-1942 radio comedy of the same name, Joe and Mabel starred Larry Blyden as Joe, a cab driver, and Nita Talbot as his girlfriend Mabel. 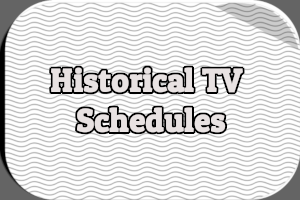 CBS planned to premiere the show in September 1955 but instead the network scrapped six completed episodes and started over with a new producer. 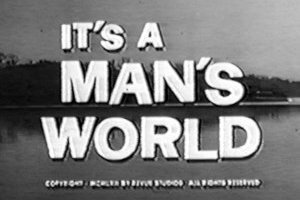 The series finally debuted on June 26th, 1956 and ran for 13 weeks, with the final episode airing on September 25th. Supporting cast members included Luella Gear, Michael Mann, and Norman Fell. Learn more about Joe and Mabel by reading my in-depth article about the show. 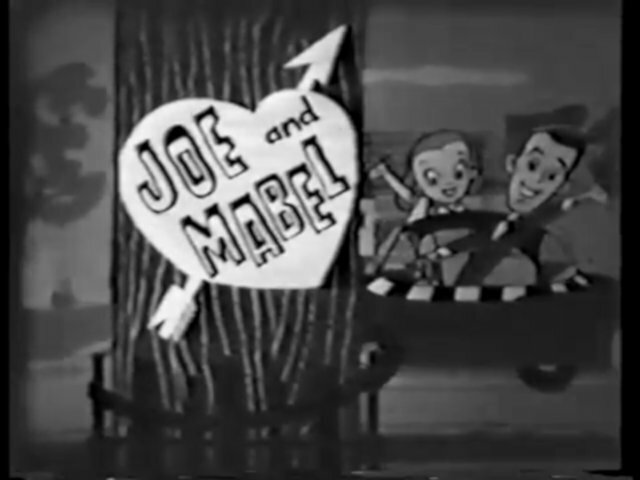 Each episode of Joe and Mabel opens with Joe in his cab, talking to the viewer as if they’re sitting in the backseat. “Mabel’s Voice” starts with Joe explaining how music almost tore him and Mabel apart. We then flash back to Joe and Mabel watching an amateur talent program on television. Joe is enamored with a woman from Nebraska who sings “Beautiful Dreamer.” But Mabel finds the woman–and her singing–underwhelming. She’s convinced Joe finds the woman attractive. Joe thinks Mabel is jealous of the woman’s talent. Upset, Mabel kicks Joe out of the apartment she shares with her mother and brother. Joe says he’ll see her Thursday night, giving her three days to cool off. 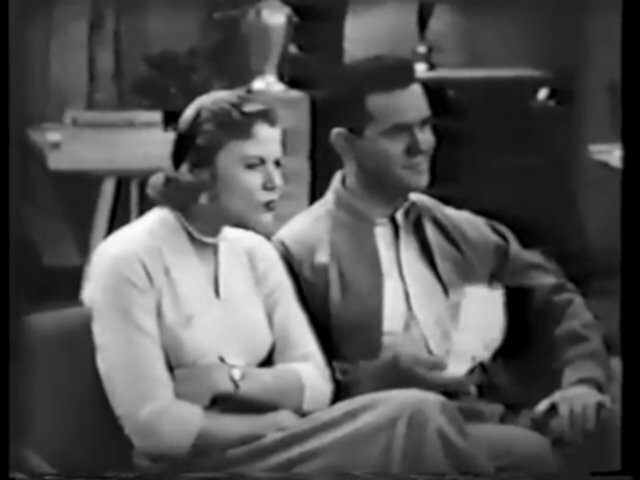 Nita Talbot as Mabel Spooner and Larry Blyden as Joe Sparton. Mabel sits down and finds herself a vocal coach. Despite her utter lack of talent, Ralph Caruso agrees to give her private singing lessons. Unfortunately, when he arrives at Mabel’s apartment Thursday evening for a lesson, Joe drops by and overhears Caruso in the apartment. The two bicker about trust. When Mabel tells Joe she’ll be busy every evening for the next two months, Joe explodes. He gives her back the birthday and Christmas presents she gave him and storms off. But Mabel isn’t worried: Joe didn’t return the watch she gave him. The next day, Joe chats with Mike and Harry at the diner. He tells them of his plan to take off and see the world–without Mabel. Harry tells Joe to investigate the situation before running away. So, Joe decides to play detective and leaves. Mike tells Harry that he’ll find out what’s going on by asking Mabel. She’ll tell him, even if he has to beg and plead. Joe, in full detective mode, sets up a recording device at Mabel’s apartment (with some help from her little brother Sherman). Mike shows up to talk to Mabel. Out on the balcony, Joe misunderstands and assumes Mike is the man he heard in the apartment. He can’t watch, however, and asks Sherman to tell him what’s going on. Sherman thinks Mike is proposing, that Mabel accepts, and that the two of them are kissing. 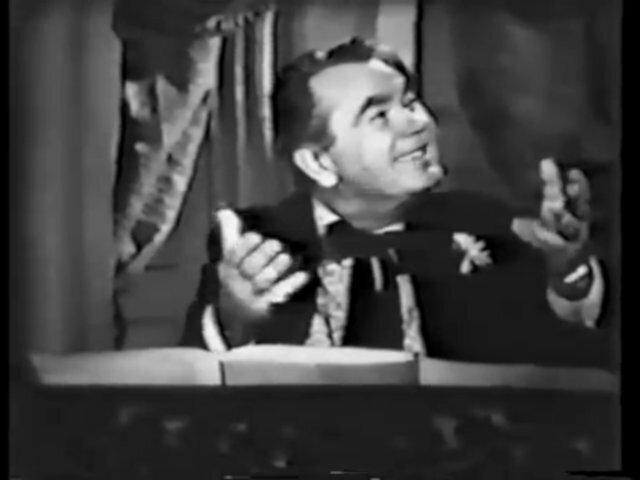 Oscar Homolka as Ralph Caruso. Instead, Mike is told about Mabel’s vocal lessons. But Joe, under the mistaken impression his good friend has stolen his girl, punches Mike in the face when he leaves the apartment building. Things come to a head when Mike brings Joe and Sherman upstairs to the apartment. Joe can’t believe that Mr. Caruso is the man he was jealous of and is still confused about what’s going on. Mabel finally tells him about the singing lessons. Joe doesn’t believe her and pulls out the tape recorder. He’s embarrassed when everyone hears him singing; he tested the recorder in the store. We then return to Joe in his cab. He starts talking about another crazy story, when he thought he was going to be a hero. 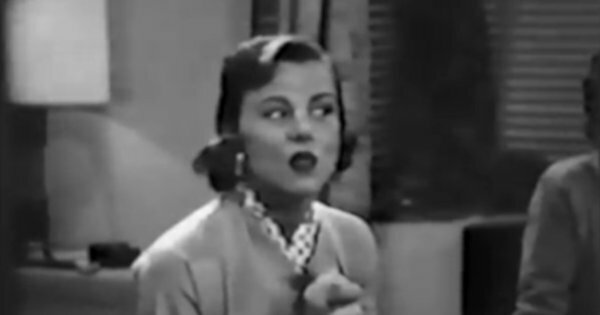 The show may be called Joe and Mabel but in my opinion, Nita Talbot is the star. In this episode and two others I’ve seen, she’s the standout among the cast and a delight to watch. Mabel is feisty and bold without being domineering. Larry Blyden portrays Joe a man who considers himself practical and realistic, yet can’t help overreacting to the mildest of situations. The rest of the cast is fine, although limited by their supporting roles. Michael Mann and Luella Gear, as Mabel’s brother and mother, respectively, pop up in a few scenes but don’t contribute much. 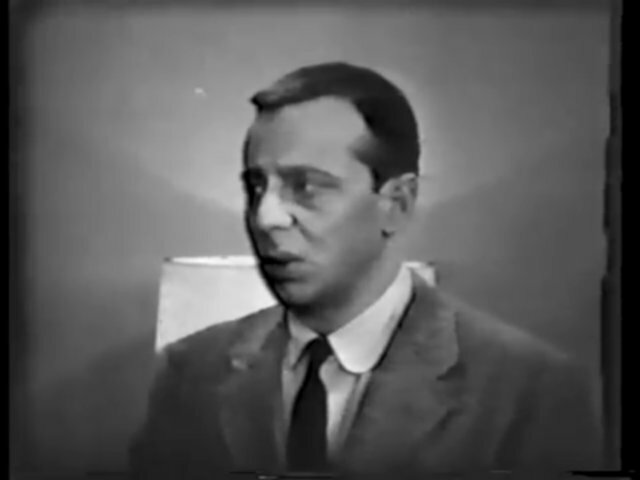 Norman Fell is the straight man, painfully aware of the madcap antics of his friends. “Mabel’s Voice” is not great television, however. The script is weak, the story stale and obvious, and the tired jokes overwhelmed by the laugh track. 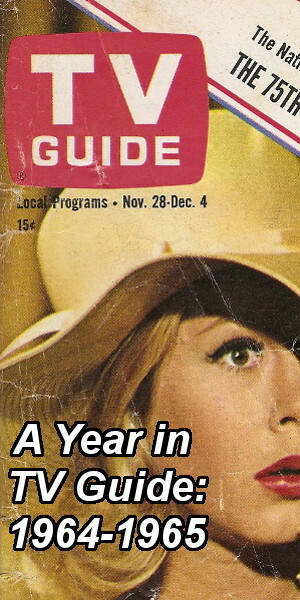 If not for Nita Talbot, it wouldn’t be worth watching. I don’t know if she can sing or not but she can act like she can’t. Mabel’s singing is as enthusiastic as it is terrible. Guest star Oscar Homolka is intentionally outrageous as vocal coach Ralph Caruso, who may be no better at singing than Mabel despite his high opinion of his own talent. Based on the last few seconds of the episode, Joe is previewing an episode called “The Lineup.” Curiously, that episode aired on July 10th, 1956–almost two months before “Mabel’s Voice.” Did CBS air Joe and Mabel out of order? Joe and Mabel is not commercially available on any format. 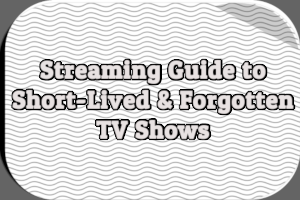 You may be able to find a few episodes on YouTube. 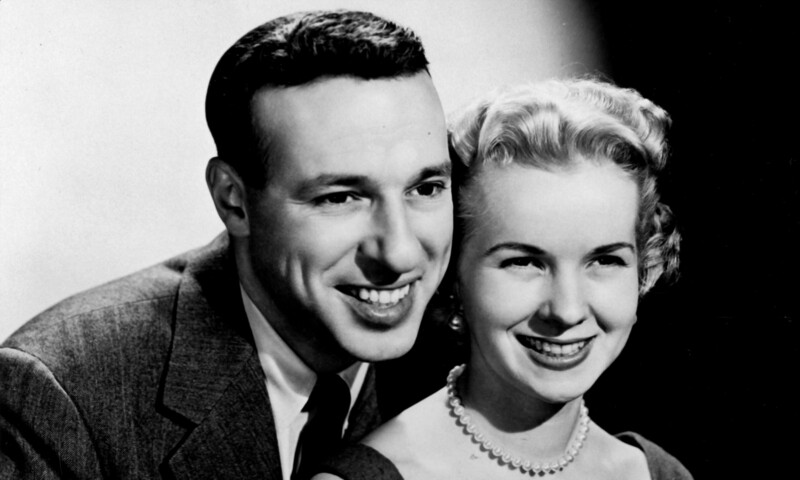 Do you remember watching Joe and Mabel back in 1956? Were you a fan of the show? Hit the comments with your thoughts and recollections. NOTE: I accidentally published an incomplete version of this review in December 2017. That’s right, it took me nearly ten months to get around to finishing it. Thank you for this review. I would like to someday get a chance to see at least one episode of this series. Thank you for this review. It is very interesting. I always liked Nita Talbot. It could be that she could sing, because it is difficult for someone who really cannot sing to do it convincingly in a TV show or movie or play. If they cannot sing, they just sound bad, but if they really can sing, they can make it funny or do various tricks with their voice to make it sound off key intentionally or other things.